The purpose of this training was to update the Cerealis staff on new developments and products from Ag Leader, such as the all-new DualTrac™ ultra low-speed steering system and SureForce™ hydraulic downforce system for planters. Cerealis is the distributor for Ag Leader in South Africa and sub-Saharan Africa and like any other Ag Leader distributor, they are keen to stay updated on Ag Leader’s year-round precision farming products so that they can provide unparalleled support in their local area. Of course it was not all hard work and there was also time for some fun and socialising during the week also! Left to Right: Chris le Roux, Lesley Swanepoel, Lourens van Rensburg, Jonathan Francisco, Andries Botha, and Johan Reichel. 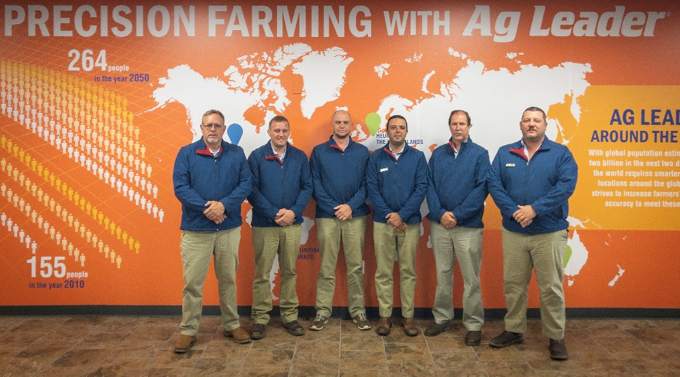 Ag Leader is a global company with staff and dealers located around the world. Find your local Ag Leader dealer here!